End of year compilations were not NOW’s style. They tried it once before, using NOW 4 as a way of hoodwinking the public into buying a compilation that had only a passing resemblance to the vinyl album of the same name. The fact that they ditched the idea straight away probably suggests the public didn’t take too kindly to the deceit. So, it was very odd to discover when researching NOW 8 that while that album was the first to be released as a proper CD version (all be it, one which contained little over half the songs of its vinyl big brother), it also found itself in competition with a rival, and not just a Hits album either. For some reason, NOW made every effort to scupper the fledging CD format for their wildly successful series, by releasing an end-of-year compilation (on CD only) just two weeks before the release of NOW 8, and in doing so, robbed NOW 8’s CD of the album’s choicest songs, nabbing them for the year-end party edition instead. This sounds utterly absurd but I’m going to try and give NOW the benefit of the doubt and see if I can decipher what the hell was going on here. First things first, in 1986, as I discussed in relation to NOW 8, the thought of a double CD release for a series geared towards pocket moneyed teenagers would probably have been prohibitively expensive. In today’s money, a double CD cost around £45-50, at a time when some kids (like little old me) we lucky to get about £2 a week. It’s also pretty steep for something as ephemeral as a NOW album, to be fair. Forking out around £10 (in old money) for a double album or cassette for yourself, or for a present for someone didn’t seem quite as bad (though today’s kids seem quite happy to pay £45 for a video game they’ll only play for a few months before the next ‘must have’ release arrives, but I digress…). So there may have been some twisted logic in this: why not release TWO albums, each mutually exclusive of the other; there is not one track which appears on both NOW 8 (CD) and Now ’86. You give the public the opportunity to make its choice, and, no doubt, the series would continue on with which ever concept sold more copies. It’s a risky strategy, but it’s the only possibility I can think of. I really have no idea what they were thinking. With the rival Hits Album also releasing a CD version of its latest release (Hits 5 featuring George Michael, Whitney Houston, Paul Simon and, er, Don Johnson) maybe panic set in. November 1986 would prove to be very busy: Hits 5 was released on 10th November, Now ’86 a week later on the 17th, with NOW 8 following a fortnight later on the 28th. It was normal for NOW and Hits to give each other a couple of weeks breathing room, normally enough for both to take number one, if only for a week, but NOW would eventually win out, far outselling its main competitor. But the sudden appearance of NOW ’86 must have muddied the waters somewhat. What NOW ’86 DIDN’T do, was tear up the charts. It managed just four weeks on the chart, reaching a dismal number 65 (this can be partially explained by the fact it was only available on CD). In contrast Telstar’s Greatest Hits of 1986 reached number 8, selling well over 100,000 copies. It was a double album, and not available on CD, but its line up was weaker than either NOW or Hits, being a mixed bag of the less popular tunes from both camps, and a couple of ‘couldn’t care less’ inclusions like Modern Talking’s Brother Louie and Atlantic Starr’s Secret Lovers. Meh. Now ’86’s chart performance is somewhat baffling, even given its format restriction. It has a much better line-up than any of its rivals, containing four number ones (West End Girls, Don’t Leave Me This Way, I Wanna Wake Up With You, Chain Reaction) and countless should-have-been-number-ones (Absolute Beginners, A Kind of Magic, Sledgehammer and others). It’s a brilliant selection. It was even plugged on the telly. Ah, Our Price. Never forgotten. 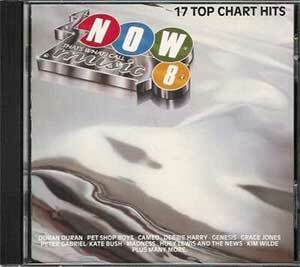 But what it did was strangle the CD version of NOW 8 at birth, as it pilfered all its best tracks. NOW 8 featured three number ones, but none of them make it onto the CD version. Two wound up on NOW ’86, whilst Nick Berry seems to have got himself locked in a cupboard on the way between the two offices. Among the other tracks, you get a couple that had appeared on NOW 7, but also a lot that haven’t been round these parts before. This is the only time West End Girls has appeared on a NOW album, for instance, which, along with Chain Reaction, had been licensed for Hits 4, from EMI, meaning their inclusion on NOW 7 or 8 was out of the question. Their rightful place on a NOW album is therefore taken . The inclusion of the slightly brilliant Ain’t Nothin’ Goin’ On But The Rent, whilst Gwen Guthrie’s abysmal cover of Close to You appeared on NOW 8 is somewhat baffling though. NOW ’86 is undoubtedly a brilliant collection (UB40 and Status Quo aside) but maybe it showed that the public wasn’t ready for NOW CD’s just yet; maybe it also shows the public doesn’t like being confused. Imagine buying someone a NOW album for Christmas 1986. Now 8, NOW ’86 or the newly re-issued NOW Christmas Album… which one did they ask for again? NOW Dance had now established itself as a secondary series, but its release pattern was carefully planned so as not to interfere with the regular series. NOW ’86 was like a hand grenade in NOW 8’s path, that somehow it survived. I can’t find sales info for just the CD version of NOW 8, but I suspect they were poor. a fact reflected in the 2nd hand market, where copies in any condition can set you back between £30-40 for one in good condition. 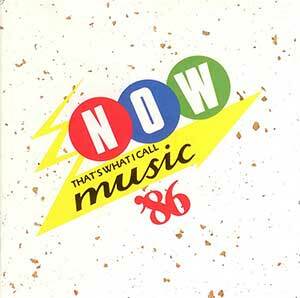 I can get a CD of NOW ’86 for less than a fiver. It’s a curious business. Maybe it was the uncertainty of the CD market, maybe it was concern over Hits stealing its sales, maybe it was just greed, but the year-end compilation would be put on ice, to be revived, more successfully, in the mid-90s, whilst the regular series would continue into 1987, and NOW 9 would again be given the ‘CD selection’ treatment. Thankfully this time, there was no direct rival from its own stable to scupper it. The Tears For Fears track is actually “Everybody Wants To RUN The World” (the Sport Relief re-working) – apparently one of the reasons why the ‘Now 86’ CD is now so collectable is that I believe it remains the only place this track can be located on CD. It didn’t warrant an inclusion on their Greatest Hits CD as it’s so similar to the original version (and the change to the lyric renders the meaning of the song completely meaningless – not that “Rule” was ever easy to decipher itself) and the single plugged that long gap between TFF’s second and third studio albums. Track 04, 07, 09 and 12 – “exclusive” to NOW 86.